Medical personal alarms are devices that are designed to ensure that if there is an immediate hazard complicating the health and/or life of an individual that requires medical assistance that personnel trained in the emergency medical field are appropriately routed to that individual. There are a minimum of two components that are part of this type of alarm system. A wireless transmitter is typically held by a patient, and there is a central station that works to carefully monitor any type of signal that is activated by wireless transmitters. Medical alarms are typically issued to individuals that are considered to be disabled, as well as to the elderly. However, they may be implemented in other types of situations involving those that are not disabled or elderly. There are many unique types of medical alarms available on the market today. Emergency transmitters in which a patient wears on their person are available in a pendant version, a watch version, and there are several other types of jewelry available on the market today that are transmitters to medical personal alarms. In addition to these types, there are other types that can be placed on or near a person through the home. Examples include alarms that indicate a fall has occurred, bedwetting, detectors that can detect motion in certain areas, and devices that are similar in nature. Medical alarms make it possible for an individual to acquire the medical assistance that they require urgently without the hassle of attempting to reach a telephone located in and/or around the home in which the person resides. These medical alarms emit a signal or alarm that reaches a base station where live operators stand by twenty four hours a day, every single day of the year. Typically, there is a small microphone built into the alarm unit or transmitter in which these operators can use to communicate with the individual that is experiencing a medical emergency. This is a relatively new feature when it comes to medical alarms. This will allow the operators at the base or central station to gain an understanding of the medical emergency that has occurred with the wearer of the alarm transmitter. 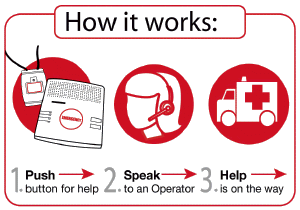 In turn, the operators will take that information and convey it to dispatchers that send out emergency medical personnel such as paramedics, fire and rescue units , and even law enforcement personnel. Many medical personal alarms will allow a patient to program contact information of their friends, relatives, and neighbors into the database that controls who is contacted during an emergency. There are many medical personal alarms that operate a bit differently than those we have reviewed here. These alarms include a button in which a patient must press at intervals throughout the day. There are many types of names associated with this type. Many refer to it as a "Passive Alarm", while others may call it a "Safety Clock". Then, there are many that will call it a "Dead Man's Switch". It goes on the notion that if the patient checks in by pressing the button on regular intervals daily, that individual is doing well. However, if the patient fails to press the alarm on the medical personal alarms of this nature, a call is made to confirm their well-being. In some instances, a neighbor or a relative may be dispatched to the home of the wearer. If assistance is required, medical personnel may be assigned to check in with the patient. Medical personal alarms come in many forms and styles, but they are a necessary element to the protection of those that are sick, elderly, and/or disabled. Ask Your Medical Personal Alarm and Home Alarms Question HERE!